It seems that half a grand is the magic number above which any high-end slate is considered expensive, set forth by Apple's iPad franchise that starts at this price. How do you achieve that price point with a tablet that runs full-blown Windows 8, though? 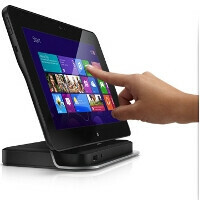 Dell has managed to do it, and announced it will be selling a $499 Latitude 10 essentials Win 8 slate. The Essentials version gets down low to the magical price by getting rid of Wacom's active digitizer, which is present on the more expensive 10" Latitude tablet, as well as introducing a sealed battery, instead of a swappable one. The 64 GB one can be had for $579 as we speak, whereas the more affordable $499 version will sport 32 gigs, and should be shipping this quarter. This actually puts the Dell Latitude 10 Essentials at the same price point as the Acer Iconia Tab W510, which is also powered by an Atom processor, has 2 GB of RAM, and 32 GB of internal memory, as well as the same 10" 1366x768 screen as the Dell. "Dell's heritage is rooted in meeting the needs of our customers with cost effective, tailored solutions that empower them to reach their potential be it in the office, classroom or hospital," said Neil Hand, vice president, Dell end user computing products. "This legacy, combined with our portfolio of new enterprise services and product offerings, such as the Latitude 10, enables our customers to deploy the latest technology while balancing IT control and end-user productivity." As with the other Latitude 10 configurations, the new tablet is framed in magnesium alloy and covered with soft-touch paint for enhanced durability and a good grip. Corning® Gorilla® Glass delivers a responsive touch experience and vivid graphics display and stands up to the test of busy and active users. The Latitude 10 powers through typical school or work day and with optional Dell ProSupport™ , an expert engineer is available 24/7 online or by phone for unexpected hardware and software remote troubleshooting to keep end-users productive no matter where they are. "Our commitment to innovation in education runs deep, and the Latitude 10 essentials configuration offers the robust accessibility features and personalized learning experience educators, students, and parents tell us they need for a productive classroom." said Mark Horan, Dell global education vice president. "An end-to-end education solutions provider, Dell designed this tablet with schools in mind to provide an affordable, efficient device that is a snap to manage and deploy while protecting previous investments in applications and other classroom devices". The Latitude 10 essentials configuration 64 GB is available today starting at $579US and the32 GB will be available in the coming months at $499US. It joins the Latitude 10 standard configuration announced in October 2012. Nice1 Dell, less price for a great features..
i dont think these tablets are great products...good yes but nothin great. for one id ont understand why there is an atom processorr inside! its like the netbook crap all over again but this time without a keyboard! And the other thing is why are these manufacturrs so miserly in providing a regular size 256 gb ssd which is considerably cheap by the way in these tabs? these tabs cost lesser than an ultrabook or netbook to manufacture and for something I have to pay full blown laptop prices for I want the same config as a laptop. there are tabs with full windows 8 an i5 mobile processor which is a full blown computing processor and 4 to 8gb ram so why is Dell charging this much for this under-speced tab? Now it gets interesting. Who in their right mind would drop $500 on a galaxy tab 10.1 ? ?